The goal with any kind of calorie you consume is that it would elevate your blood sugar and keep it level. The problem with juices (and other sweet drinks) is the sugar quickly enters your blood stream which raises your blood sugar level rapidly. The calories in juice are very concentrated. Just half a cup (4 ounces) of apple juice has 60 calories, the same as a small apple, minus the fiber to slow the release of sugar. Fiber: Instead of drinking OJ, eat an orange. The fiber in the orange is the speed bump. Protein: Instead of eating a plain piece of toast, add 1 Tbs. of peanut butter. The protein in the peanuts is the speed bump. Fat: Instead of eating plain oatmeal, have oatmeal with 1 ounce of nuts. The fat in the nuts is the speed bump (as is the protein). If you think you can’t make it through the day without your juice, here are some healthy ways to enjoy juice. If you have a home juicer, consider making juice using mainly vegetables. Vegetables are naturally low in sugar and veggie juice may be a good option for you. If you still want to enjoy your daily juice, READ YOUR LABELS! 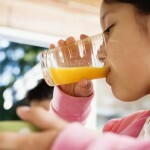 Low sugar juice, in small amounts (4-6 ounces) can still be part of your healthy daily routine. 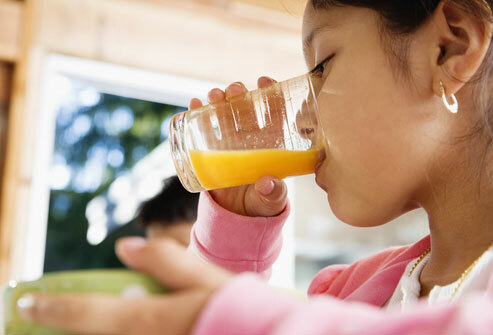 Find a juice that has less than 10 grams of sugar per servings. Also, make sure the juice doesn’t contain artificial sweeteners. If I have a craving for juice, I add about 2 ounces of low sugar juice to 8 ounces of club soda. I still get a bit of sweetness but without the excess sugar. Add all of the ingredients to a clear pitcher and fill with ice water. Best served slightly chilled or at room temperature. *make sure you wash the fruit before you slice it.